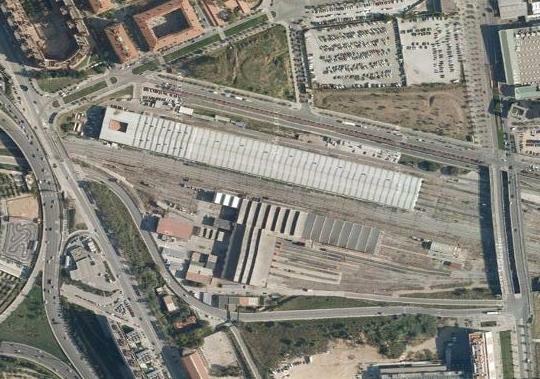 The project includes the construction of a new workshop in the same location as the current one, to be kept in service during the works, and the covering for subsequent location of a green area on it. The design of a stretch of road tunnel and road access is included. One Functional Project, which aims to allow the necessary coordination with other organizations in order to obtain a consensus of the designed solution, is included. The main building of new workshop has a total floor area of 13,680.4 m². First level maintenance will be undertaken therein. An area of shooting and repair of bogies is also located, so far production sections for replacement of the different elements. A washing machine and a wheel lathe are provided. Offices, warehouses and locker rooms are foreseen as well. An Environmental Integration Annex is drafted. A cover is designed to allow the provision of a park thereon. The total projected area of slab is 43,874 m². The definition of machinery and equipment, and internal networks for accurate installations that are required (power and electricity, gas, telephone, compressed air supply, etc.) has been included. The installation of 4.82 km of track, all electrified, partly by conventional catenary and other by rigid catenary has been planned. A new electronic interlocking for the government of the workshop, including its local control has been provided. It has been also designed a road tunnel of 335 m in length. 2 metal walkways are included. The project is completed with the final design of all elements of civil engineering and railway sub-structure, super-structure, architecture, and replacement of roads, right of way and utilities affected.